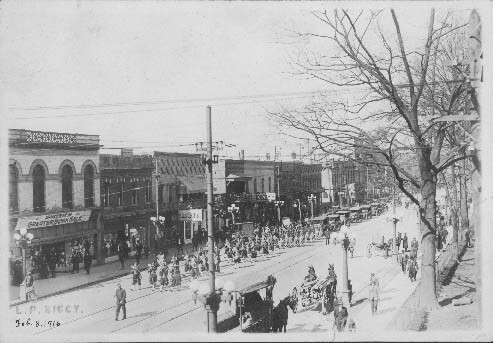 The first parade featuring the new Shriner's Band took place on February 8, 1916. The buildings along the 200 block of West Trade Street are visible. They include Smith's Bookstore at 215 West Trade Street, the Star Cafe at 229 West Trade Street, Climax Barber Shop and Pool Room at 215 West Trade Street, Fites Cash Grocer and Carolina Pawn and Loan Company at 217 West Trade Street.